Even though this route was cancelled in 2015, it posted around 60,000 passengers in 2014. Hanover features potential for business travel. Also has VFR potential since Lithuanian expats live in the region. The capital of Finland, Helsinki features potencial for business travel. This destination has a strong tourism potential, similar to Palma de Mallorca and Alicante, each of them serving around 20,000 passengers over the summer seasons. Two-way tourism potential. Incoming VFR traffic. A city break potential - inbound tourism. Has high VFR potential since Lithuanian expats live in the region. 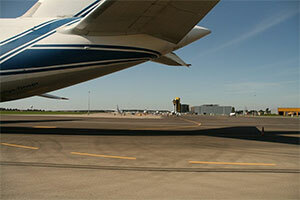 Oulu – route of high inbound potential. Finnish tourists are familiar already with Kaunas from the high-success case of Kaunas-Tampere. 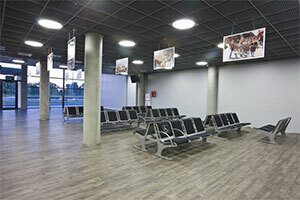 Route has support from both Lithuanian Airports and Kaunas municipality. 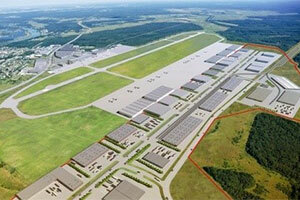 Stuttgart features potential for business travel. Also has VFR potential since Lithuanian expats live in the region. There is inbound tourism potential for this route. The link was last served in 2013 and posted around 16,000 passengers that year. Nonetheless, over 30,000 passengers were noted in the previous years. Most highly sought after route from Lithuania. Pure outbound tourism, potentially route can serve a minimum of 25k passengers per year. This route was served from Vilnius in the past, recording around 7,000 passengers. Large migrant communities are living in the region. 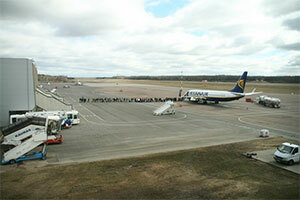 Turku – route of high inbound potential. Finnish tourists are familiar already with Kaunas from the high-success case of Kaunas-Tampere. Route has support from both Lithuanian Airports and Kaunas municipality. There is a city break and inbound tourism potential to this destination. 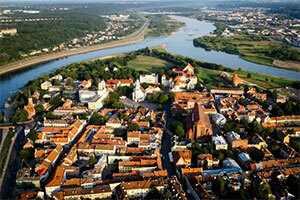 Formerly the capital of Lithuania, Kaunas impresses today’s visitor. In fact, the city welcomes the visitor with statues of freedom fighters, poets, and grand dukes. Furthermore, its heroic past is present in the remnants of a castle. The fact that Kaunas was Lithuania's capital during the 1920s and 1930s has left the city with many architectural gems of that period. Lithuania is becoming an increasingly attractive destination for both tourist and business traffic, as figures for 2017 attest. Following the 7% growth compared to 2016. 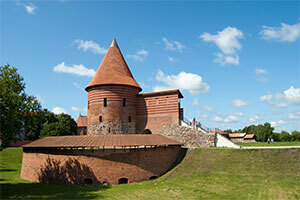 Kaunas’ heroic past is present in the remnants of a castle. Supposedly, the first brick castle at the confluence of the rivers the Nemunas and the Neris was built at the 14th century when the attacks of Teutonic Order began. The castle was fence-type, without towers, it had double walls from stones and bricks from the outside. 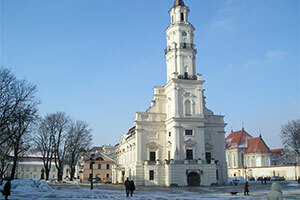 In 1920, when Poland occupied Vilnius, Kaunas became the capital of the independent Republic of Lithuania (1920–1939) and the most important Lithuanian city. As the economy was growing, it was sought to make the capital a modern European city. Kaunas’ Town Hall is distinguished by its slenderness and grace; it is often called The White Swan. Its tower of height of 53 meters is the highest in the old city. 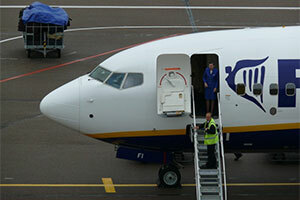 In May 2010, Ryanair opened its first base in Eastern Europe, at Kaunas Airport. The phrase missing from your Lithuanian phrase book, which every network planner should know: ‘Bazės Atidarymas’ = ‘Base Opening’. According to Lithuanian tradition, an oak tree was planted as a symbol of the strength and long life of the cooperation between Kaunas Airport and Ryanair. Nowadays, the Irish ULCC connects Kaunas to Birmingham, London Stansted, Ovda, London Gatwick, Oslo Rygge, Dublin, London Luton, Copenhagen, Malta, Bristol, Shannon and Malta. Possible support from Kaunas region. Airline incentive program; please contact us for further details on the Airline Incentive Program. Lithuania is served by three commercial airports, namely Vilnius, Kaunas and Palanga. Kaunas Airport is located in the central part of the country, 14 kilometres away from the second largest city in Lithuania that has a population of 301,357. 180-minute catchment area – over 3.5 million population. Kaunas Airport is located in close proximity to the Free Economic Zone (FEZ), a 534 hectare industrial development area, which offers favorable and smaller taxes for the investors that invest at least €1 million. Kaunas Airport features significant air freight time savings, between one and one hour and a half, from Southeast Asia when compared to other European air cargo hubs (Amsterdam and Frankfurt). Kaunas Airport is the second busiest airport in Lithuania, having handled 724,314 passengers in 2014. The airport is changing rapidly, with a progressive future vision and becoming the base for aviation-related businesses through implementation of the AEROHUB KUN investment project. 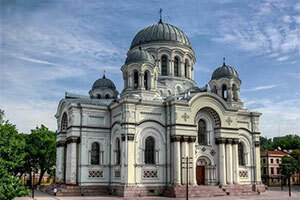 Situated in central part of Lithuanian, around 14 kilometres away from the city centre. 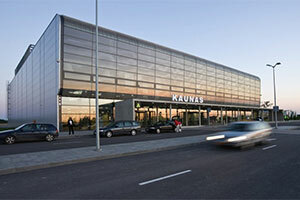 Kaunas Airport is connected to the city centre via direct bus. There are also intercity services to Vilnius, Klaipėda, Riga and many other Lithuanian cities from the airport. A segment of Rail Baltica between Kaunas and the Polish border officially opened on 16 October 2015. Lithuanian Airports has launched an ambitious aviation-related business development project at Kaunas Airport – AEROHUB KUN. Lithuanian Airports is seeking to capitalise on Kaunas’ strategically-favourable geographic location by attracting a cluster of aviation-related companies, with phase one already completed. With the completion of Rail Baltica project and nearby Kaunas Intermodal Terminal, Kaunas is set to become one of the strongest cargo transportation and logistics centres in the Baltic Sea region. 1,186,081 passengers served in 2017. 3,292 tons of cargo served in 2017.